Cracking price, battery last for ages with 24 hrs playtime and 18 month warranty. Patented Sound Technology: Full-bodied stereo realized through dual full-range drivers and a unique patented spiral bass port. Carefully designed transducers keep total harmonic distortion below 1% for superior audio clarity that's unprecedented in this price range. Groundbreaking Battery Life: 24-hour / 500-song playtime powered by a built-in high capacity Li-ion battery and Anker's innovative power management technology. Bluetooth 4.0: Instantly pair to your smartphone, tablet or to any Bluetooth compatible device and start streaming lossless CD-quality sound from up to 66 feet away. SoundCore reconnects automatically to the last device used. Built-in mic lets you take hands-free calls at any time. SoundCore’s curved edges and sleek controls accentuate its unibody design. Choose from red, blue, or black to perfectly complement your home and style. Dual full-range drivers, a patented bass port, and a fine-tuned Digital Signal Processor present music with rousing highs and deep lows. Even at high volumes, there’s less harmonic distortion resulting in remarkable clarity. 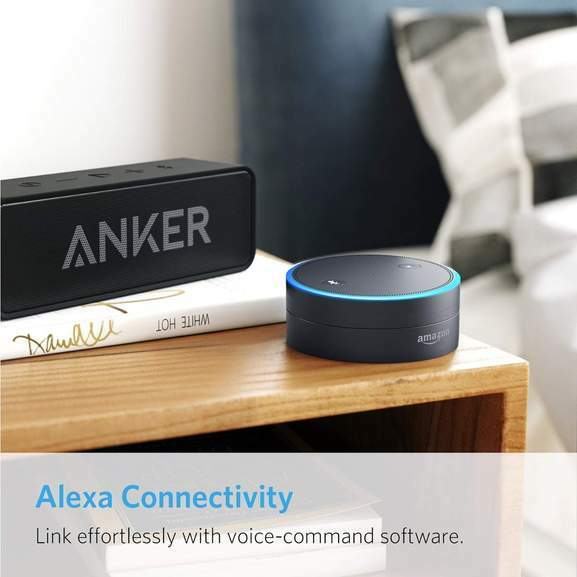 SoundCore synergizes Anker’s power management technology and a high-efficiency Li-ion battery for up to 24 hours of sublime audio. Bluetooth 4.0 ensures your devices maintain a strong, stable connection up to 66 ft away for skip-free music. Use with phones, tablets and almost any other Bluetooth-enabled device. SoundCore reconnects to the last device used for instant music playback.